Microsoft's Power BI data visualization and business intelligence service will be generally available in two weeks, marking a major milestone for the new product. The launch will bring a smorgasbord of new features, including new chart types, a refreshed desktop application and support for collaborating in groups on shared sets of data. Power BI was first released to the public as a beta earlier this year, and is designed to provide ordinary business users with powerful tools to visualize information from diverse data sets in live-updating dashboards. 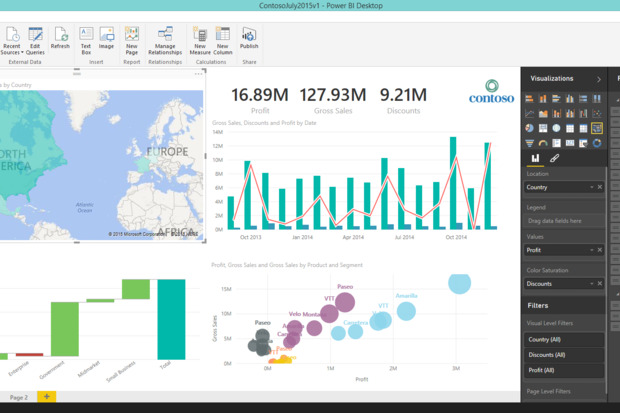 Power BI is built around three core components: datasets, which contain all of the raw information a user brings into Power BI; reports, which organize that data into a set of charts and graphs and dashboards, which are single live-updating pages that provide an at-a-glance look at specific visualizations based on those reports. The tool can pull in content from a company's data using connections to a variety of sources including Azure SQL Database, Azure SQL Data Warehouse, SQL Server Analysis Services and the newly-released Apache Spark on Azure HDInsight service. In addition to those data sources, Microsoft has added a number of "content packs" from third party vendors like Salesforce, Acumatica, GitHub and Zendesk. The packs will pull in datasets from those services, and also include pre-populated reports and dashboards designed to get users off the ground and quickly display relevant information. Power BI now also allows users to create their own content packs from within the tool so they can easily share what they're working on with co-workers. What's more, Microsoft Corporate Vice President James Phillips said that there are many more such packs that connect with outside services to come as the product continues to evolve. "We are releasing a new content pack now -- at least one -- every week," he said. "And we have a backlog that could keep us on that pace for a year." Microsoft has also rebranded its Power BI Designer app for Windows, which lets business analysts create reports for display inside the Power BI service, as Power BI Desktop. The app also received new features to enhance its data modeling capabilities including Calculated Columns and Data Categorization. In addition, Microsoft is taking the entire visualization stack that makes Power BI's charts and graphs tick and releasing it as an open source repository on Github. The company will be taking code submissions from members of the open source community to add new features and even wholly new visualization types. In the future, users will be able to design and import custom charts that Microsoft hasn't added to the service into Power BI. Power BI has proven quite popular among its early adopters, Phillips said. In the six months it has been available in beta, it picked up users at more than 45,000 companies in 185 countries. The product puts Microsoft into competition with Tableau, its neighbor in Seattle which also offers data visualization tools on a software-as-a-service model. Once the service reaches general availability, Phillips said that he expects the Power BI team will increase its pace of launching new features. The company releases a new version of Power BI every week, and there's still plenty more to be done. "For the last year, we have been dividing our energy between laying the foundational stuff and the core infrastructure, and building the features on top of that," he said. "We've gotten to a place now that we're able to shift a lot more energy back to features once we're at [general availability]." People can try Power BI for free by signing up with their business email address and using the service's free tier, which caps its data capacity at 1GB per user and only allows them to refresh their data daily. A Power BI Pro subscription costs $9.99 per user per month, and ups the service's data capacity to 10GB per user and adds support for hourly refresh along with a bunch of other benefits.